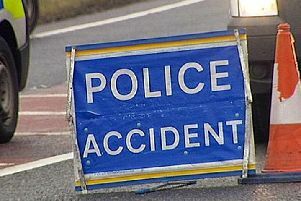 The incident, which involved a black Ford Fiesta and a Land Rover Freelander, happened at about 9.30pm. The road was closed for several hours while a police investigation took place and debris was cleared from the scene. Anyone who was in the area at 9.30pm last night and saw either the black Ford Fiesta or the Land Rover Freelander before the collision, or saw the collision itself, is asked to call 101 quoting incident number 440 of February 11.